The Rhino's in Kaziranga made the trip unforgettable, while the chilled weather and the breathtaking views of lakes and mountains in Tawang, left a lasting impression of the Land of Dawn Lit Mountains. This in theory also completed 50% of our trip. A bit of homesickness had started to kick in. A bit of tiredness and mainly missing home cooked food or the regular Idli's and Dosas back in Bangalore. The next part of the trip was to visit Meghalaya, mainly Cherrapunji, The Root Bridges and the Dawki Border towards Bangladesh. Now, to enter Shillong, we had to head back to Guwahati. As per our initial plan, we had taken into account 2 days to reach Guwahati from Tawang. After discussing with our driver, we decided to complete the distance in one day. It will be a little hectic but we will end up with an extra day in our hands. Well, that's at least what we thought. We started around 7:00am from the Tenzing Homestay. We had an early breakfast and left Tawang. The initial part of the journey, the first half an hour was in complete silence. Not even the music was playing the vehicle. It was as if we left a beautiful memory behind us. Even our cameras were inside the bags. Since it was six days up, we were also running short of cash in hand and had to find some ATM where we could withdraw. Things which are kind of taken for granted by us were not the same in these areas. Most of the ATM's even near the Army Canteen's were mostly running dry. When we saw a Dzo, on the way, we got back to our core elements. We got the camera out and did what we do the best. Shoot. As we moved on, it was kind of a refresher of the area which we had traversed a couple of days back. Just that we were looking at things from the other direction. The views were different, so were the perspectives, not just from what we saw, even what we felt. While going up, there was a sense of longing to see, now it was more of, what we will not see again. Since it was early morning, while driving through the villages, we could see school children, with their backpacks walking towards the school. Most of them in uniform and many not in. Though we travelled around 2-3kms ahead, we did see kids with the same uniform still walking towards the school. Which means, they all had to travel all this distance on a daily basis. Every place has its own set of struggles. We did see a lot of these animals on the way. Mainly the Dzos. Another point to mention, we didn't see a single Yak up until now. What we saw were only Dzo's which are a cross breed between a Cow and a Yak. A touching picture of Cow and the Calf. One last view of the Sela Lake. We really didn't want to leave from this place. The serenity really makes you stand still there. As we moved closer to Dirang, we saw some structures, which we missed to see while coming. When reached the spots where we could see the Gorichen Mountain, we had to stop at multiple places to take the best possible shot again. The snow-capped mountains are always a stopper for pictures. On Reaching Bomdilla, we found an ATM which had money in it, and we all withdrew sufficient cash for probably the rest of the trip. A few pics near the Bomdilla town. We were told by an Army person, whom we had given a lift on the way, to have lunch near Rupa Bridge, after crossing Bomdilla. It was a nice Army Canteen, but with limited options but good food. We stopped there at Chulha and had a hearty meal. The place was next to the river(Dirang River I assume). There was an ATM too in that area and a nice shopping area, where all we had was a cup of coffee. I paid him by giving a 500 Rupee note and in return, I got new 100 rupee notes as change. I hadn't seen the new 100 rupees up until then. And its been a month ever since I have come back to Bangalore, and yet to another new 100 rupee note. We then came towards Rupa Bridge and crossed over to travel towards Guwahati. It was close to 2:40 pm in the afternoon and we only had crossed Bomdilla. Panic Button? Crossed a few villages and I can say, it was as if we were literally going next to their houses. The roads were really bad, or I can say, just muddy roads. No Tar. Just because it was the Mahindra Xylo, we were not tossed up and down on those roads. I am sure even an Innova wouldn't have been able to handle that terrain. On another note, while we were at the Tenzing Homestay, another guest had come in a new Innova Crysta. which had got hit at the bottom and due to which the fuel tank got a leak. Somehow they managed to reach Tawang. Though we learnt later from our next driver, that Innova does work well, but only with experienced drivers. Xylo had no issues at all, more so, considering our rash driver, who would only fly the vehicle even on these roads. 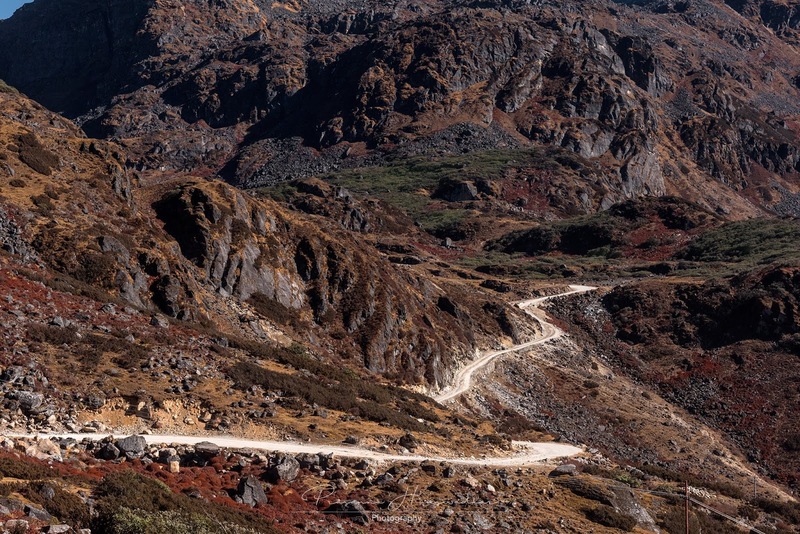 On touching the Trans Himalayan Highway, we felt that finally, we were on a smooth road. It had just started to get dark now. The road was fantastic, but we couldn't really see the views which we were looking for. We filled in some gas at the next station. We were told that we will almost cross Bhutan Border on the way, and its ideal to fill in gas there, more so as it's cheaper also. We filled half a tank and continued. The above picture was the last picture which we took during that day. After a point, due to the same terrain, and darkness, we were resigned to the cars only. Just having the casual discussions with the driver. It had been six days, we have known him. As a person, he was good, not really as a driver though. During our discussions, we got to know about our driver's family and his place etc. Also learnt of some of the customs in Arunachal Pradesh. Apparently, it's a Matriarchal Society which some of them follow. So after the wedding, the Guy comes and stays over at the Girls place. Not something we are used to hearing. As we moved ahead, we tried to look for a place, where we can get tea. But we didn't. The roads were no longer that great, and quite bumpy after a point. Around 7 pm or so, our Driver told us that the fuel is coming down and might get over suddenly. Apparently, the indicator needle apparently doesn't go down linearly, but more of an abrupt jump in the Xylo, as we move into the RED area of the fuel indicator. Our agenda, changed from looking for a tea shop to finding a petrol bunk. Since we were on the Himalayan Trans Highway, I was expecting some fuel station, but miles and miles there was nothing in store. We tried to take one village or town at a time, hoping that we will get one in that place, but every place left us disheartened. The fuel indicator is going down slowly. I am the only person in the vehicle, apart from the driver who could see the indicator clearly. I only kept quiet, without making much of a scene. But our crazy driver was all in for tantrums. He started reminding us that, this is Bodo Land, and it's not ideal to get stopped there. Things only got difficult, but still, the vehicle was going smooth. The worst part was that, since we were very close to the Bhutan Border, our GPS was not working, probably blocked at the International Borders. So was the internet and the phone connectivity. Nothing seemed to go our way. We had the local maps saved in the mobiles and using that, we were trying to see if we can find something, which can lead us to a fuel station. We could hardly see any people also. In some areas, we could see lights mainly of camps from the BSF, and small shops. But nothing which would have helped us. The other parameter which we were fighting with, was the time. Mostly after 8 pm, most of these fuel stations close down for the day. At one point, on the bad stretch of road, I could hardly see anything in front. Suddenly I saw a small stick which said, if water is above the stick level, DO NOT CROSS. Took me a few seconds to gather that, we were crossing a small stream. There was water falling from the top also. But our driver didn't think about any of these and he didn't even know to read English, happily crossed the stream with a huge splash. It was all good again and we were back on the so-called roads. A new found respect for Mahindra Xylo. Is my next car going to by Xylo ? Eventually, after crossing a lot of dark roads, with no sign of humans nor animals, we managed to a check post. There was a BSF person standing there. So before crossing that barrier, we decided to ask him for the closest fuel station, But he was not at all helpful. Only gave us ambiguous answers. There were two roads there, one which we could have continued on the Trans Himalayan Highway, while another would take us to the National Highway. We did go ahead after crossing the check post on the Trans Himalayan Highway, but after a couple of kilometres, things didn't look good to us. We felt getting back on the NH was better. So we turned back and came to the check post again, and crossed it and went towards the NH. Once we entered that road, we met a few villagers and they told us that, we will not be able to get inside the Bhutan fuel station at this hour as they wouldn't allow going inside Bhutan. And also, the fuel station would be closed. It was around 7:30 pm. But they indicated that we will get there in a few kilometres if we continued on the same road. The next few kilometres were not easy. The road was not at all good, and very bad lights on the way. The only good part was that there were other vehicles also on this road, a sign much better than the Himalayan Highway. Crossing a few more Kilometers, we saw some lights at a junction. We seemed to be on the right path as indicated by the Villagers earlier. We took the designated turn and finally saw a Fuel Station. After a long time, finally, we all spoke with some energy. This place was technically Assam now. Our driver spoke to the person standing there, but he seemed have officially closed for the day, with all the accounts done and dusted for the day. We did request him, but he didn't budge. He told us to go to the next fuel station which was around 9 km from there. Having no option we headed in that direction and we were glad to see a proper town with shops and fuel station. We filled up the gas and went to have tea. The tea never tasted so good before. Gulped down some potato chips too. The next agenda on the list was to find a hotel to stay close by. After a lot of googling, going through the reviews and phone calls, we finally decided we had to go Mangal Doi area to get a decent hotel. It was already quite late. Around 8:30 then, and the hotel seemed to be around 45 km away from there. We asked the hotel folks to keep the dinner ready for us. The road again, was not good, but the situation was better. We didn't mind much. Then somewhere on the way, we stopped, just to enjoy the beautiful black sky. It was kind of Bodo land, but we didn't mind now. We had gone through enough for the day. While we got close to the hotel, there seemed to be some kind of mela that day. I think it was Ram Navami or something that day. So, we did see a lot of activity and a lot of people suddenly. It felt good to see the people around. Once we reached the hotel we quickly had our dinner and resigned for the day. What a hell of a day it was !!!! Kindly leave your comments in the blog let us know your feedback. The Bumla Pass is the border between India (Arunachal Pradesh) and China. Or more technically, India and South Tibet. Arunachal Pradesh, was earlier called a North East Frontier Agency, and later became an UT in 1972 and that's when the name Arunachal Pradesh was given to this place which translates into 'Land of Dawn-Lit Mountains'. Finally in 1987, it was declared as a state. Arunachal Pradesh - The Land of Dawn-Lit Mountain. Aruna, means the first rays of the sun in the morning. 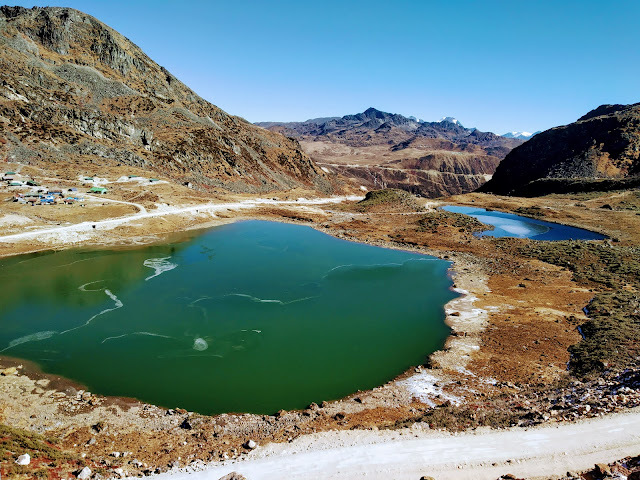 Tawang was a part of Tibet, and still sometimes referred as South Tibet. 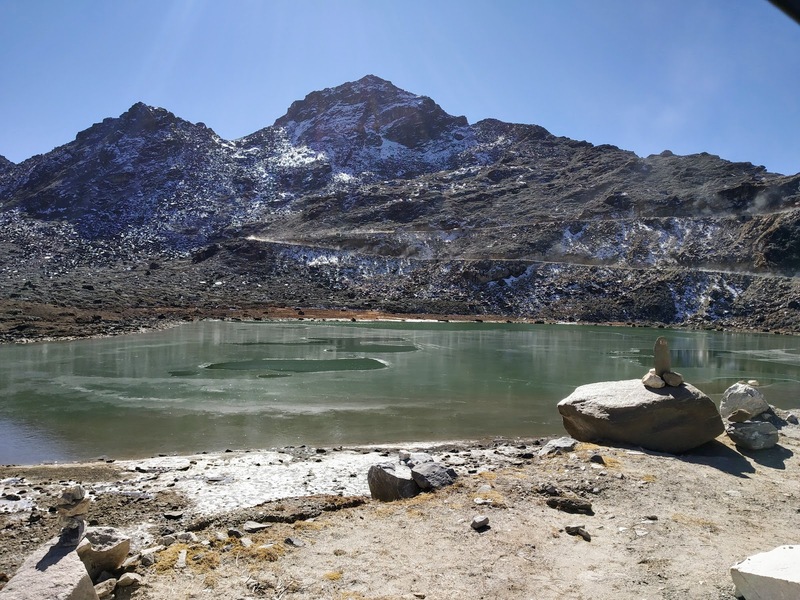 If one looks at geography, Tibet and Tawang, are a lot alike, and why not ? It was a part of Tibet then. Due to some discussion between the British and the People of Tibet, Tawang was given to Tibet, but then China always claimed that Tibet was a part of China , which people from Tibet don't want to agree with. Moral of the Story, Tibet finally preferred Tawang to be Part of India rather than China. So the border, which Arunachal Pradesh shares with China, is not actually China. Its Tibet Occupied by China. We had reached Tawang the previous day around 3:30 pm and also had got the Special Permit for Bumla. The ILP is one of the document, which needs to be submitted for this Special Permit. Normally the hotels where one stays, gets these arranged. To go to Bumla, only specific vehicles , which are part of the Taxi Association will be allowed. So we can't take our personal vehicles nor any other hired vehicle. We were told that, the trip to Bumla pass and other sight seeing places like the Madhuri Lake, will cost 5000/- INR. Its more of a fixed price. Also note, these Permits are only given to Indian Nationals. Though the offices which issue these permits are actually open till 4 pm, but due to late arrival of guests, which is normally the case, they do issue these till 6 pm. 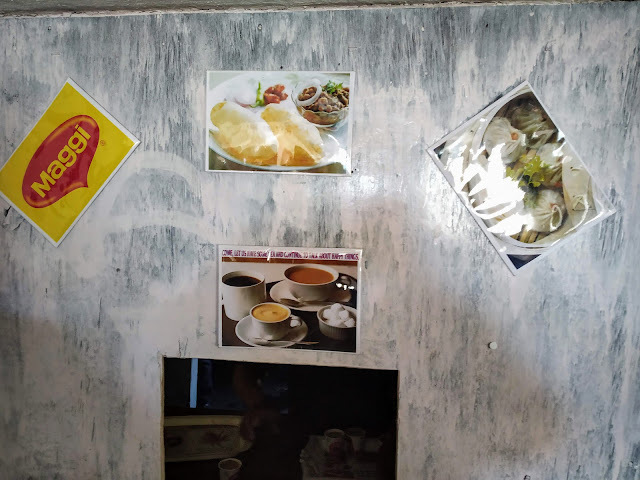 We had a nice breakfast of Aloo Parathas in the morning, along with nice tea at the Tenzing Homestay, where we had put up. The people managing this place were really nice. They are 3 sisters if I am not wrong, and trust me, they really manage it well. One thing, we couldn't help noticing was that the ladies in this part were really hardworking. By hardworking, I am not saying they are busy, but they do lot of work, which we would normally see, only men doing in our parts of the country. The local driver there, came around 8 am with a pretty new Mahindra Xylo. This Xylo was in a much much better shape and well maintained, compared to the one which we were travelling. The driver was well educated and knew English and Hindi quite fluently. He had studied in Delhi and he was quite a well mannered person, and informative if I can add. We first crossed the city limits,if I can say so, and slowly started to move higher altitude. Can't say the road was bad. It was bumpy. The definition of good road had probably changed ever since we started this trip. We had to show the Permit to the Army folks before we moved towards the Y Junction. Y-Junction is the point, where one road leads to Bumla, while the other towards Sangester Lake(Madhuri Lake). This lake is on the way to the Bumla Pass, and better known as Ptso Lake. 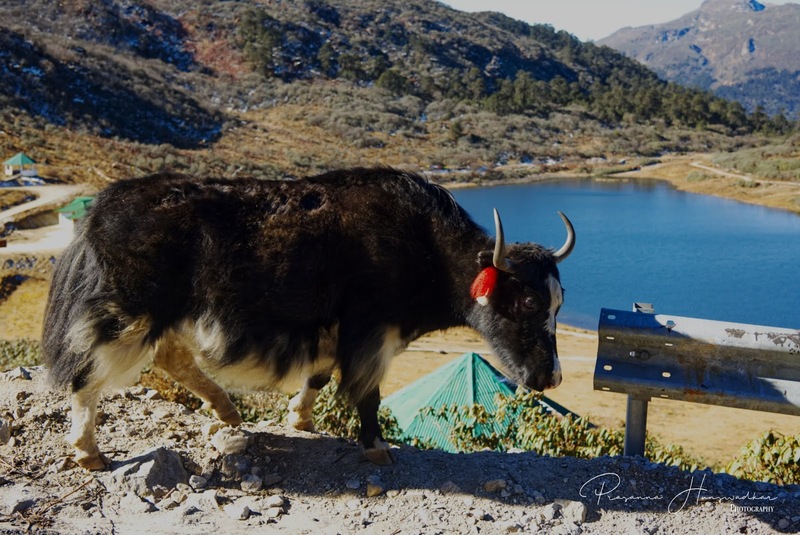 We also saw a Yak with Red Ears here. They were different from the ones we had seen earlier. The view of the Lake by itself was surreal, with a small Bridge in the middle, gave a different dimension to the view. So, it took us around 2 hours to reach the Bumla Pass and once we reached there, and after completing the security formalities, we were made to sit in a huge waiting hall. Hot tea was served, which was a God send, more so, considering the weather and the wind. I have to admit, due to the heavy wind and open spaces, it was the coldest experience I had during this trip. We were then escorted by a jawan from the army who took us for a short walk till the last point in India. Whenever some dignitary or Senior Army Personnel arrives, they will normally keep a memento here with the Date. The land we see here, is not part of India. Its kind of No Mans land. At the Border. The hill in the backdrop is where the Chinese Military is present. Finally at more than 15,000 feet, we reached the India Tibet Border. I am purposefully mentioning it as Tibet, as its actually Tibet which we are sharing the border, and not China. It was a touching moment for us, to reach a place, which only army folks are residing and protecting us. At this camp, there is a Hot Line Phone connection with the Chinese Army, and if there are any problems they discuss it over this line.. Apart from that, there are meetings held here 5 times in a year, with the army folks from both the sides being present. If I am not wrong, out of the 5 days, 3 dates are the important calendar days from India and 2 of China. 15th Aug and 26 Jan feature among the 3 dates from India's preference days. I picked up a cap and t-shirt at this camp, which served as a souvenir from this strategic location. To visit the Sangester Lake, we had to return on the same route , up until the Y Junction. And then moved towards the lake. The pictures below are on route to this lake. After a lot of driving, more of downhill this time, we got the first glimpse of the Sangester Lake. Better known as the Madhuri Lake. Though I mentioned downhill, this lake is at a height of 12500 feet above sea level. 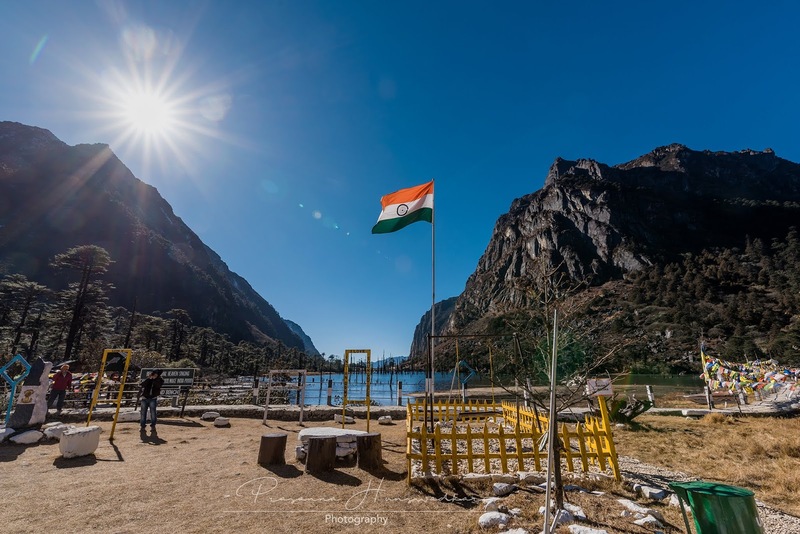 Its referred to as the Madhuri Lake as , Madhuri Dixit, the famous Indian film star had done a dance sequence for a movie, Koyla here(Song - Tanhai Tanhai). I was wondering, in which weather did they did the shooting there, as it was freaking cold there, and doing a full song sequence, in the middle of no where, is no easy task. This movie, was one of the biggest thing that happened to this small town and got known for. Its strange sometimes, how bollywood movies can change the tourism of a place. On the way down from this point, we saw a lot of old Bunkers , which were used during the 1962 war with China. They are not in use now. We managed to get a few pictures of them, but don't really want to post them here, even though they are obsolete. The roads were completely covered with snow, even though, it hadn't snowed for many days. Suddenly we could hear the sound of water falls - I just stopped there, enjoyed the whole falls for a minute or two in the freezing cold, just seeing the water finding its way down wards. The pictures might not make justice to it. Probably a badly taken video might just work here. So this Lake, was created due to a huge earthquake in 1971 and most of the people staying in this location couldn't survive. The Tibetan Flags - There is something about them, which makes them feel so lively. Couldn't stop taking many pictures of them... By both Prasanna and me. 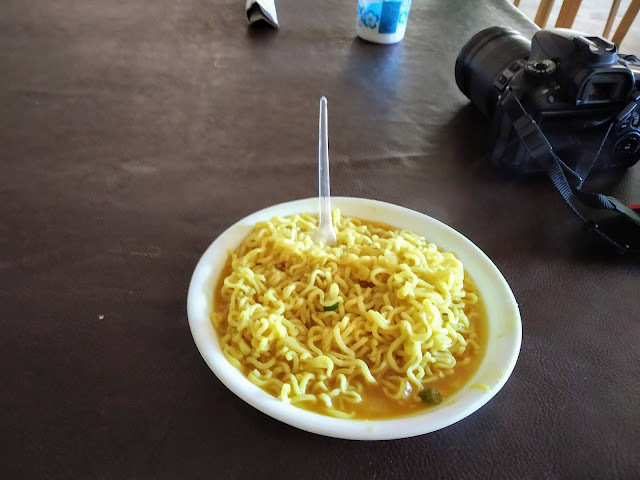 It was lunch time, I started with a nice plate of Maggi Noodles followed by Chana Batura ( Yes, the regular lunch/breakfast we have got all through this trip). I did make sure to add a cup of tea also. The food here is served by the army folks again and we didn't see any civilians in this area at all. The National Flag Flying High...And everyone in this area works towards this to remain high always. We Started to move uphill towards Tawang finally. One the way, we found a peculiar memorial, if I can call it so. Its called the Beedi Baba Memorial. As you can see, there is a Beedi prototype, which is a local type of cigarette( Tobacco wrapped in a particular leaf) found in India quite easily. Not sure of the history of the place nor the significance of the memorial, but apparently some soldier who was fond of smoking beedi. So a memorial is made in his name, and a huge beedi is also placed next to it. We learnt from our driver that, every day couple of jawans would come and keep a packet of beedi at this place. Sounds Weird , but true. Had it not for this memorial which we actually saw, wouldn't have believed this story. This is the vehicle which took us to all the difficult terrains. My new found respect to this Mahindra Vehicle. I would rate it much higher than the Innova, especially in such terrains. Just before we reached the Nagula Lake, we found a couple of Army Jawans walking down the road. We stopped and asked them whether they would want a drop. They happily agreed. Apparently they don't ask for lift from any tourists as many don't really stop which off course makes them feel bad. Many a times they don't get a army vehicle to drop them to the town. We later realised that, they would have to walk around 23 kms to reach the town, had we not stopped. One request to all the tourists, if its possible to give a drop, please stop and then ask them, as they will not ask as such. I do understand that, since we were all guys, it was easy to ask and offer. During the chat which we had with them, we got a lot of insights of the situation in this region from the army folks. One person was managing the artillery, which kind of means , he operates a gun which is a little smaller than a Bofors Gun. But even those guns are really huge. One of the points he mentioned was that the life in these border areas, had improved for them, after the Modi Government had come in, in more than one way. There are lot of improvements in the life they live in these areas. More facilities, better winter clothes etc and many such things, which makes their lives much much better to live in such weather. They were really in praise for the Modi Government. Apparently huge difference in the past 4 years or so. Listening to the people who are actually on the border protecting us, say such words have lot of value, rather than listening to updates from Paid Media and Whatsapp forwards. Though he was quick to remark that, there has not been any improvements as such on the personal front, when they need to travel back home, or with regards to leave policies etc. But as long as they are at the border, the facilities have drastically changed for the better. We asked him about a news which we had got in the media and also had gone viral,that a particular jawan didn't get proper food in the difficult area where he was posted. His take was that, each place is managed by a Army unit. If one person has been discriminated, then it would be an issue in that army unit, rather than the supply to that unit. Distribution of food and other supplies is from a centralised place. He was of the opinion that, its very rare that food supplies etc are not reaching them, unless some huge landslide etc have blocked the traffic. Even then the supplies do reach them via air transport. We finally dropped them at the Tawang Town. It was a exchange of gratitude when they left, followed by a Jai Hind. Another aspect which really hit us, was the mobile connectivity in these region, especially in the higher region. We saw jawan's climbing the hills so that they can get proper range and can speak to their folks back home. Both the above photos above, show how they need to keep searching for mobile connectivity. It felt really bad, especially since they stay away from families and its so difficult to reach their near and dear ones in today's age. I do hope that this message reaches the heads of the telecom companies to improve the connectivity in these areas. Finally, we went to the last destination of the day, ie the Monastery. The Tawang Monastery is the second biggest in the world, after the Lhasa Monastery in Tibet. With that we completed the day 6 of the trip and headed back to the hotel with lots of information and better perspective of our neighboring countries , who are protecting us from them and the efforts done by them. We planned to start back to Guwahati the next day, directly from Tawang. Though we thought that it would be an relatively easy day, it was not meant to be. More of Day 7 in the next part of this blog series. Please provide your feedback in the comments section.